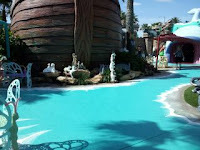 In Orlando there is a theme park called "The Holy Land Experience." It was originally built with private money and eventually was purchased by the Trinity Broadcasting Network. I have not been to the real Holy Land but I have read the bible and I have a very active imagination. I dream in color. 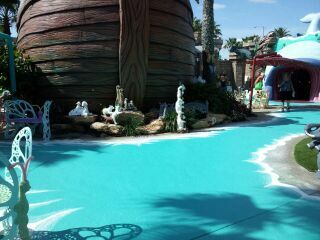 The Holy Land Experience is not what I picture when I read the bible. I am not going to write a post on what I think of the various organized religion's interpretations of the biblical and historic events portrayed in the shows and exhibits at this park. I am not going to write about my thoughts on the gold thrones, platinum loungers and glitzy get-ups on the figures in the wax museum. I am going to keep this about keeping the pounds off with Jesus. There is a show called Sermon on the Mount. You walk out to a lovely grassy area and sit in the very hot sun while actor playing The Son stands on the Mount and recites the Sermon (blessed be the poor, blessed by the children . . . . ). 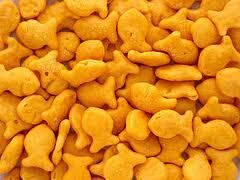 In the bible it is at the Sermon on the Mount that Jesus multiplied the loaves and fishes to feed the thousands. During THIS experience actors pass through the small crowd of theme park visitors with baskets of Pepperidge Farm Gold Fish Crackers, thereby combining loaves and fishes into a one-handed snack. I did not bite. There is a snack shop called Holy Grounds - yes, it is a coffee place. They also sell all manner of food Jesus would not recognize as food, if you know what I mean. A friend I was with was eyeing up all the various snack bars: What Would Jesus Eat Fruit and Nut bars, Scripture Snacks, Bible Bars. Seriously folks, you can't make this stuff up - Bible Bars! There are people who would chow down on this stuff simply because they think "it was good enough for the Lord, so it must be good for me . 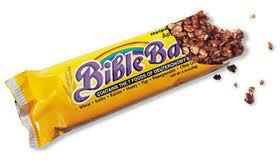 . . . ." Yet, no where did I see a claim that this is what Jesus really ate, so I felt safe in passing it up. I brought a portable lunch with me: eggs, carrots, apple, water and a lemon to add some zing to the water. We ate in the shadow of Noah's Ark (passing through the parting of the Red Seascape to get there). After lunch we walked on water (seriously, the sidewalk there is painted to reflect walking atop water) and then we visited the wax museum before leaving. Many theme parks will allow you to bring in a single meal if you have food issues. None allow glass containers. This park allowed our lunches and water bottles. Universal does not allow beverages other than a water bottle but I can bring a meal with me. Disney allows all manner of food and non-alcoholic beverages as long as there is no glass. Seaworld is does not allow beverages other than water and they will limit you to a small mount of food but no plastic bags or straws of any type are allowed. None of the parks let you bring in coolers. No wheeled containers either. I bring an insulated bag with my food and usually have small frozen water bottles in there if it is something that needs to stay cool. We can stay on our plan of eating wherever we go. I would not be keeping the pounds off if I allowed myself to think I was trapped into eating crap simply because I was at a theme park. I just ask that God give me strength to get through the hot summer without coveting the offerings at the ice cream venues every day. What do you do to get through the theme parks without packing on extra pounds to take home as souvenirs? Picture the same bird that flew in the popcorn stand, flying through all the ice cream stands. . .
VeganG - Tell your daughter to come say hi someday. Marion - Gives a new slant on food for the soul, doesn't it?